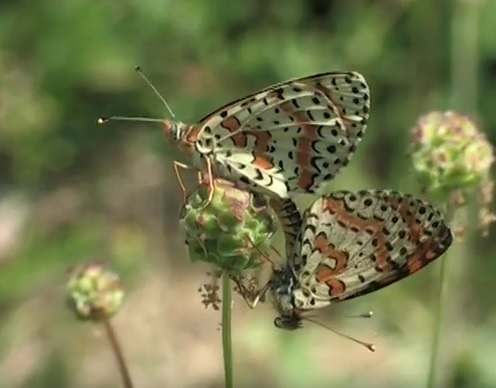 In the South of France the Spotted Fritillary flies in two generations, from April to June and from July to September, and inhabits flowery meadows and sunny grasslands. The female lays eggs under the leaves of differend herbaceous plants from the family Plantaginaceae and Scrophulariaceae. After 15 days, the eggs hatch. When the caterpillars are mature they go in search of a place to pupate. The small caterpillars of the second generation overwinter in dried plant-parts in the vegetation. 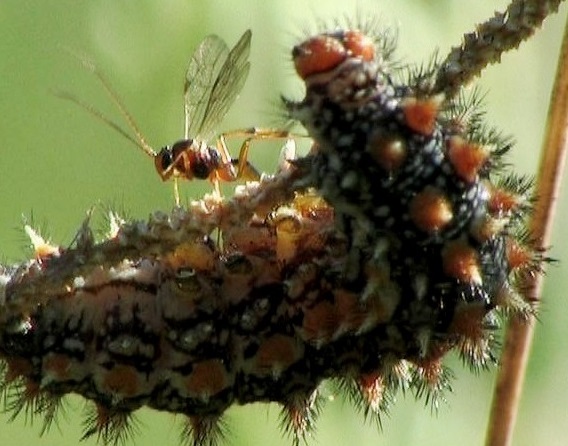 The parasitoid wasp Protapanteles hispanica (Oltra & Falco, 1996) (Hymenoptera: Ichneumonoidea: Braconidae) parasitizes the caterpillars of the Spotted Fritillary (Melitaea didyma). Up to 40 eggs can be injected by the female into the caterpillars body. When the parasitized caterpillar is mature it will expos itself on a leaf and then larvae will hatch from the host and make white cocoons under it body of het host. In the south of France the Spotted Fritillary has two generations and overwinters as half-grown caterpillar. If an overwintering caterpillar is parasitized by Cotesia hispanica the larvae will overwinter inside the body. The hyperparasitoid Mesochorus discitergus Say, 1835, (Hymenoptera: Ichneumonidae: Mesochorinae), parasitizes the larvae of many Microgasterinae (Braconidae) developing in caterpillars of several Lepidoptera species. 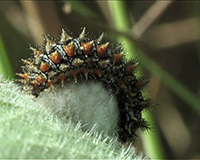 On 4 July 2014, Mesochorus discitergus has been filmed parasitizing the larvae of the primary parasitoid Protapanteles hispanica (Oltra& Falco, 1996) inside a parasitized mature caterpillar of the Spotted Fritillary (Melitaea didyma Esper, 1778). Mesochorus discitergus has an almost worldwide distribution. True hyperparasitoids attack the primary parasitoid while it is still growing inside the host!